Magnetic Media Mount Has Strong Grip That Keeps Your Device In Place! FastBall™ is a cinch to mount. Just place & stick the ball base, then attach the magnetic disk to your phone. Watch your favorite shows, record video, and follow your GPS hands-free with FastBall™ magnetic mount. Your phone slides off your console and falls at your feet. It drops off the dash and gets stuck between seats. Don't let your phone take the fall. 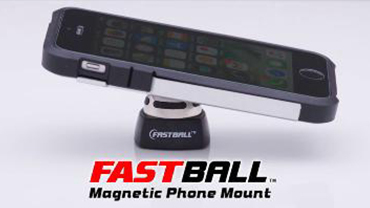 Get the new Fast Ball™, the patented magnetic mount that holds your device tight. READ FULL DESCRIPTION Fast Ball™ combines a strong, steel ball and magnetic socket to create the ultimate media mount. Easily adjust your phone 360-degrees to any angle, to any position, and your phone stays securely in place. To release, just give it a light tug. A ball and socket is the most stable, articulating joint in the human body. Now there's the Fast Ball™ socket for your phone. It's so easy to use. Just pick a spot and stick the steel ball mount on. Then, place the ultra-thin magnetic disk to the back of your phone or case. Fast Ball™ adjust and holds at any viewing angle for hands-free calling and video chats, streaming your music, and swivels for GPS and maps. You can even watch movies and shoot videos! Those old vent mounts are so flimsy. And suction mounts often let go. Fast Ball™ mounts at eye level for the perfect viewing position that holds on tight. Use to mount tablets, too - great for watching movies or following a recipe in the kitchen. Get your FastBall™ now for only $19.99 plus $7.99 shipping and handling and you'll get a second FastBall™ with your order for no additional cost. That's TWO FastBalls™ for only $19.99 plus shipping and handling That's not all! As part of our special offer, you can add the FastBall™ table stand mount to your order for just an additional $9.99. Hurry! This offer won't last long! Do not use this product on soft, flexible cases. These cases are not rigid enough to hold the magnetic phone socket. OFFER: Get your Fast Ball now for only $19.99 plus shipping and handling. But wait, you'll also get a second FastBall with your order for no additional cost. This offer isn't available in stores, so order now! GUARANTEE: Your satisfaction is 100% guaranteed. If you are dissatisfied with your Fast Ball for any reason, simply return the product within 30 days for an easy refund of your purchase price, excluding shipping and handling. See our return policy for more information. Exceptions may apply. **Do not use this product on soft, flexible cases. These cases are not rigid enough to hold the magnetic phone socket.